Going to a party this 4th of July? Then you'll be one of 144 million Americans celebrating this national holiday the traditional way. According to the National Retail Federation's 2010 Independence Day Consumer Intentions and Actions Survey, the July 4th holiday is looking to be a well-celebrated event, with about 63% of the population having a cookout, BBQ or picnic. With all this celebrating this 4th of July, you may want to take your outdoor holiday decorating up a notch? Pick up a Classic Red Knock Out® rose and pair it with white veronica and calibrahoa, and the hardy blue geranium ‘Rozanne’. Next place the Knock Out® in the container. If you have to give it a lift, set in on another container turned upside down. 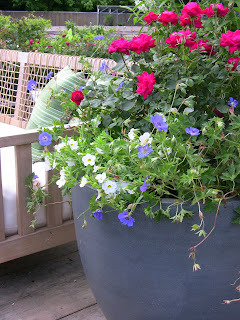 Now arrange the other plants -- still in their containers – around the rose. Top dress with pine straw, moss, coco husk or just drape the trailing plants to cover the tops of the pots. Of course, keep them watered and give them a shot of Liquid Fence Speedy Grow for a little nutrient boost. With a little imagination and help from an expert at your local garden center, you can create an instant outdoor 4th of July celebration that will last well past Labor Day!